Born in Milwaukee to the late Joseph and late Alberta Zimmer, Fr. Anthony Zimmer has four siblings, Michael, Mary Jo, Mark and Peggy. He attended Hoover Elementary in New Berlin, and Nathan Hale High School in West Allis before earning his bachelor’s degree in psychology from Marquette University. Fr. Zimmer, who attended Saint Francis de Sales Seminary, St. Francis, was ordained May 17, 1986 at the Cathedral of St. John the Evangelist, Milwaukee. Fr. 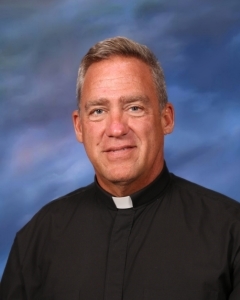 Zimmer began his priestly ministry at St. James, Franklin, 1986-1989, followed by St. John Vianney, Brookfield, 1989-1995; Pius XI High School, Milwaukee, 1995-2000; St. Charles Borromeo, Milwaukee, 2000-2010; and St. Anthony on the Lake, Pewaukee, 2010 to present.